From a 400-piece, 25-square-foot puzzle in Farinon to nearly 1,200 miniature Lafayette flags decorating the Quad, and at alumni gatherings in Europe and America, Lafayette is preparing to celebrate Founders’ Week with its second annual giving challenge to support the President’s Challenge for Financial Aid. 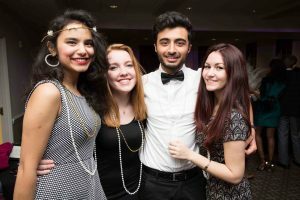 Alumni celebrate at a Wine 3/9 event. Last year, the College celebrated its founding with President Alison Byerly’s challenge to raise $1 million in one day to support financial aid. That one-day campaign netted $1.2 million from 1,132 donors. Overall, since spring 2016 more than $25 million has been raised for financial aid from more than 3,425 donors, and 50 new scholarships have been created. This year, the president is again challenging the Lafayette community at large to participate in a 39-hour online giving window beginning at 8 a.m. on March 8. Support for financial aid is integral to moving the College toward the ability to admit highly qualified students without regard for their ability to pay—an attribute shared by most of the nation’s top colleges. On-campus Founders’ Week student activities—unified under #BringTheBest—include a trivia contest, Wear Maroon Day (March 6), the President’s Ball and Senior Sips, Dine 3/9 Brunch, and an oversized puzzle version of the President’s Challenge logo. 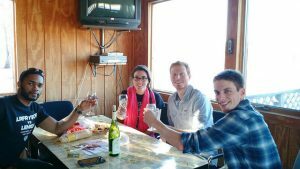 Alumni plan to gather for Wine 3/9 celebratory events in more than two dozen cities from London and Madrid to Anchorage and Atlanta. 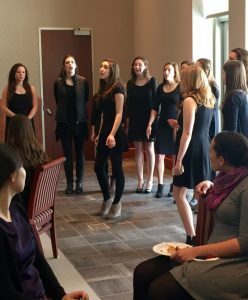 The Cadence a cappella group performs at the Dine 3/9 Brunch. 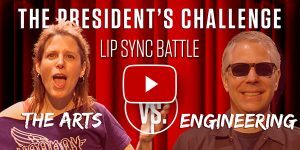 Similar to last year, when President Byerly challenged faculty and students to silly competitions in a video campaign to promote the financial aid challenge, this year she coaxed faculty and staff to participate in a lip-sync battle. The president launched the lip-sync challenge by “performing” a song from the musical Hamilton. This week’s highlighted video features arts faculty (lip-syncing “Fame”) challenging professors in engineering (“We Built this City”). Everything you need to know about the President’s Challenge for Financial Aid—including watching lip-syncing professors and learning why this effort is important to Lafayette’s future—can be found at bringthebest.lafayette.edu.